I made these cookies for a get together last week with sour cream leftover from an earlier batch of cookies. 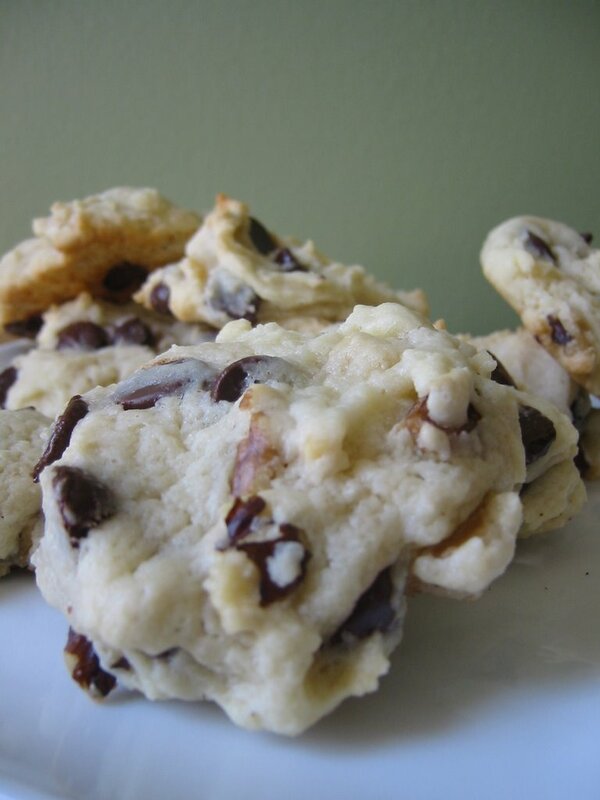 They're a take on regular chocolate chip cookies with the addition of raisins and walnuts. I opted to leave out the raisins since the no one likes them but I would have liked to leave them in because I think the chewiness would have added another texture dimension that would have complemented the smooth chocolate and crunchy nuts. These cookies are quite tasty and you get a really nice cookie dough that holds it shape in a scooper. I found that if you flatten them a bit before baking they are more circular but if you leave it as a mound, it stays that way. Either way is fine, it just depends on your preferences. The cookies brown nicely and are a little cakey but not dry. They were all gone by the end of the night so I guess everyone liked them as well. They really are a great Canadian cookie. This isn't a Key lime pie in the truest sense - I made it with Persian limes, the ones most commonly found in the average grocery store. I have never tried a real Key lime but, it seems that you don't really need it to make a nice lime pie. The recipe comes from Wanda's Pie in the Sky and is very easy to make. It is the first pie I've made that uses uncooked egg yolks. I wasn't sure how it would turn out, but it was great. It didn't taste eggy and the filling firmed up nicely and was sliceable. The filling was sweet-tart and the coconut in the crust complemented the lime, making it taste more tropical. Overall, I was happy witht the results and would not hesitate to make it again. 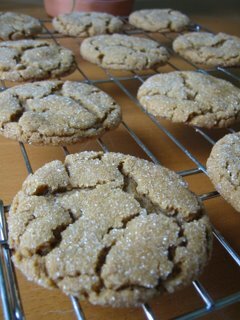 After reading about the Cocoa Cappuccino Cookies at Tea and Cookies and seeing their lovely sparkle, I decided to make a favourite cookie that is also rolled in coarse sugar - Spicy Ginger Crinkles. I've made these cookies for years and they are yummy. They consist of a molasses/ginger dough that is rolled onto balls, rolled in sugar and then baked. 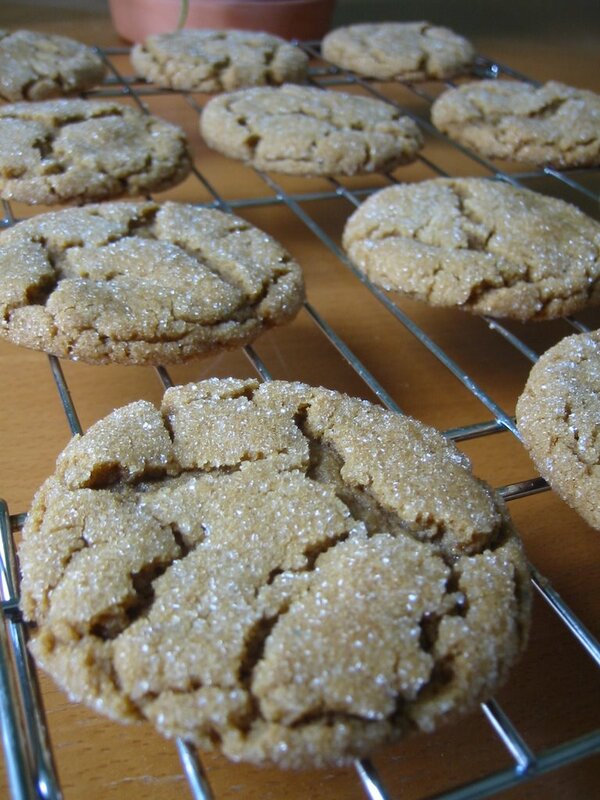 The result is a crackled, spicy cookie that is perfect with milk and tea. Kids who like strong flavours will like them too. The longer you bake then the crispier they become. Another reason that I made these is that my little neighbour, The Princess, asked me to and, as the obedient baker that I am, I quickly set out to to make her happy. Time to make a delivery! 2. 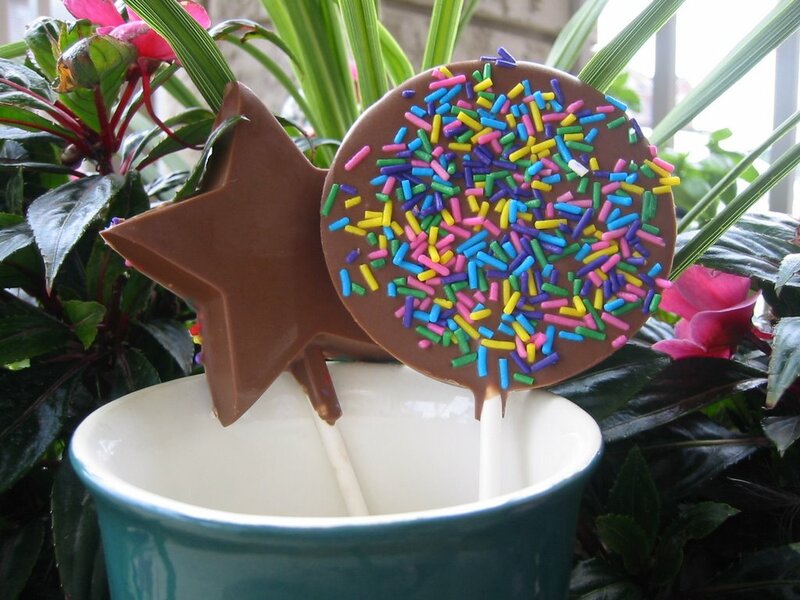 Melt chocolate and pour into molds. Add sticks. Decorate if desired. 3. Place in refrigerator until chilled and solid. 4. Pop out and enjoy! First off, I'd like to apologize for the poor picture quality. It was dark and gloomy all day and this was the best I could do before the cookies all got eaten. I wouldn't have even bothered to post them but they were so tasty I just had to. These Sour Cream Cookies are amazing. They are fluffy and cakey with the subtle tang of sour cream. 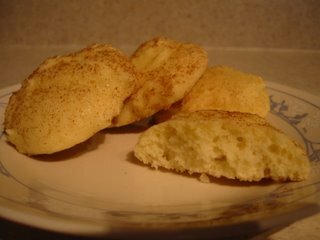 If you have eaten a snickerdoodle, these taste very similar except that they are not rolled in cinnamon sugar - it is just sprinkled on top. The dough is very soft and not easily shaped into a ball for rolling as a snickerdoodle is. That's a lot of pudding! I can see the appeal (or repulsion) of pudding - smooth creamy custard that just slides down the throat. No chewing required. 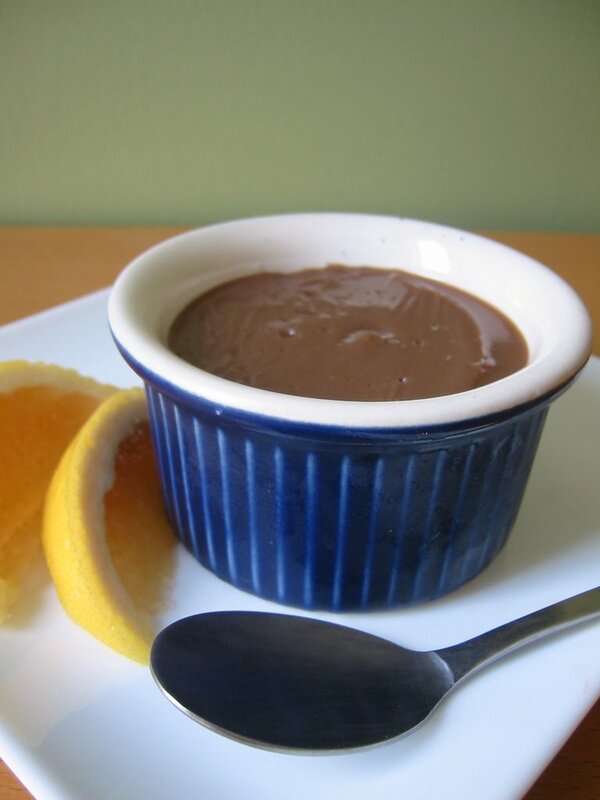 A healthy alternative to buying premade pudding or powder from the store is to make your own. By doing this, you can avoid the added chemicals and that strange aftertaste that lingers in the mouth. This hot chocolate pudding is very easy to assemble and uses ingredients found in most kitchens - milk, sugar, cocoa powder, flour and milk. It only takes about 10 minutes to whisk everything together and pour into dishes. The pudding is smooth and chocolately and is best enjoyed thoroughly chilled. Just remember to stay vigilant - if you leave it unattended it will burn quickly. If you like, throw in a strip of orange rind for flavouring and fish it out before you pour out the pudding. Add a dollop of whipped cream and/or a few fresh berries and you have a quick and yummy dessert that everyone will enjoy. I love cheesecake coffeecakes. 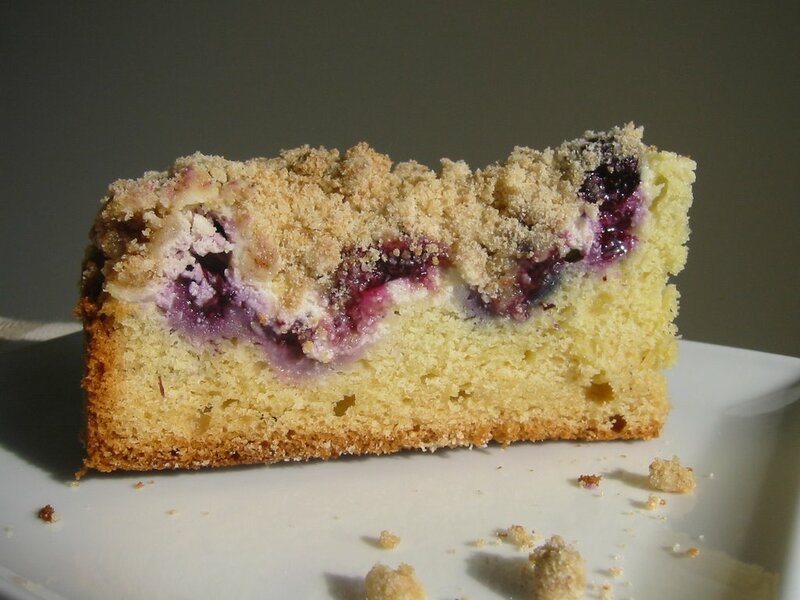 Cream cheese adds an extra dimension to the ever-popular crumb cake - a smooth melt-on-the-tongue creaminess that comes from eating a real cheesecake. Throw in some fresh blueberries and you have a cake worthy of any occasion. The cake is best served warm or at room temperature. It is moist and flavourful, bursting with juicy blueberries. The crumb topping is very complementary to the cake by adding a little bit of sweet crunch which finishes off the cake perfectly. There are three components to prepare for the cake - topping, cheese filling and cake but, if you give yourself enough time to assemble and bake it, you will be greatly rewarded. There is also a raspberry variation that, no doubt, would taste fantastic as well. Making a really good lemon square is tricky business. 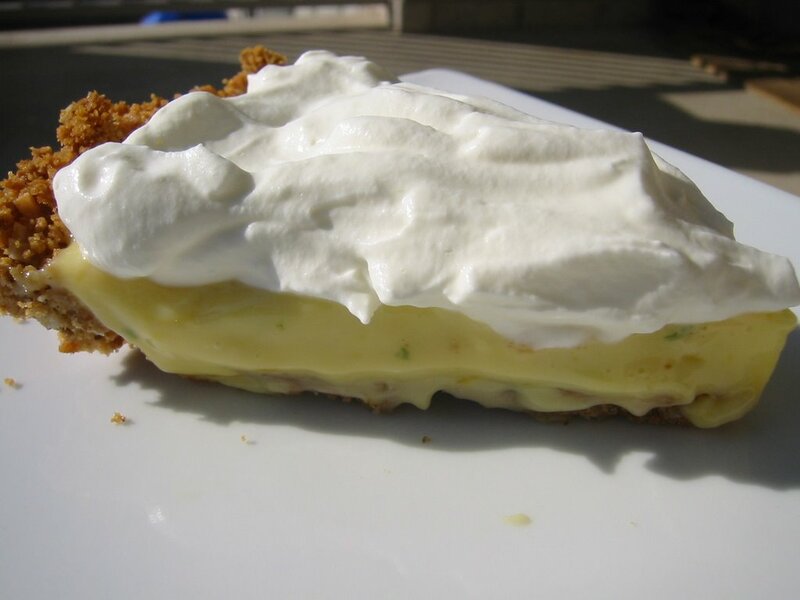 All the components have to be there - a tender shortbread crust supporting a tart, creamy lemon filling. Some problems that can occur are that your square ends up tasting eggy or that your filling gets overcooked thus becoming a solid mass. They would probaby still be edible but not nearly as pleasurable as a proper lemon bar should be. 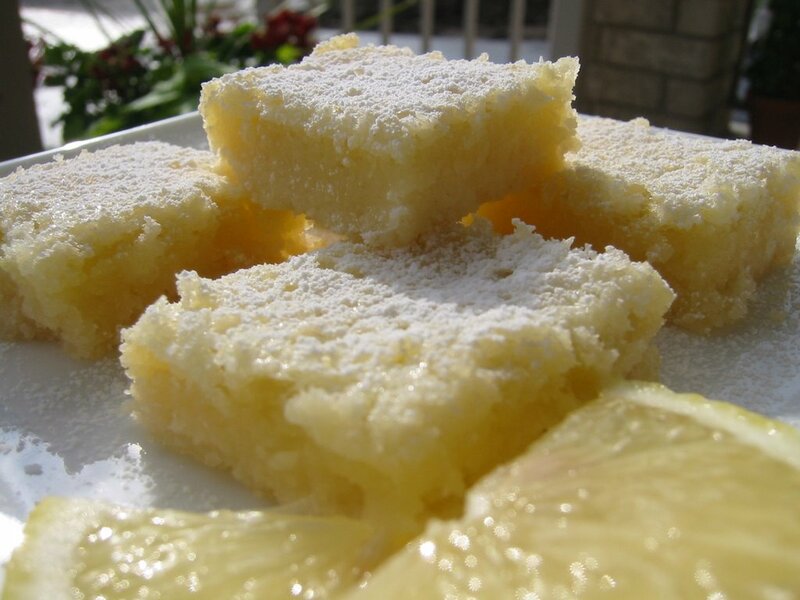 I have had my share of hits and misses with the lemon square and I think this attempt falls somewhere in the middle. Though they were enjoyed by Mr. CB, they were not 100% perfect. The shortbread was lovely and buttery but the filling could have used a little work. It was tart and lemony but not quite right somehow. Some of the filling leaked underneath the crust so some bars really had no filling to speak of - just lemon flavour. 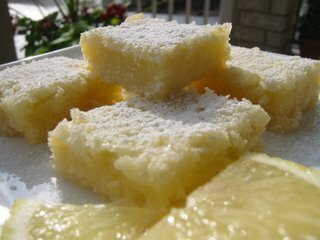 I am not discouraged though - the perfect lemon bar recipe is out there somewhere and I will find it. I really look forward to the weekends but mine are turning out to be so busy that they fly right by. I did, however, get some time to make Cheddar Apple Bars but had to wait until this morning to post about it. 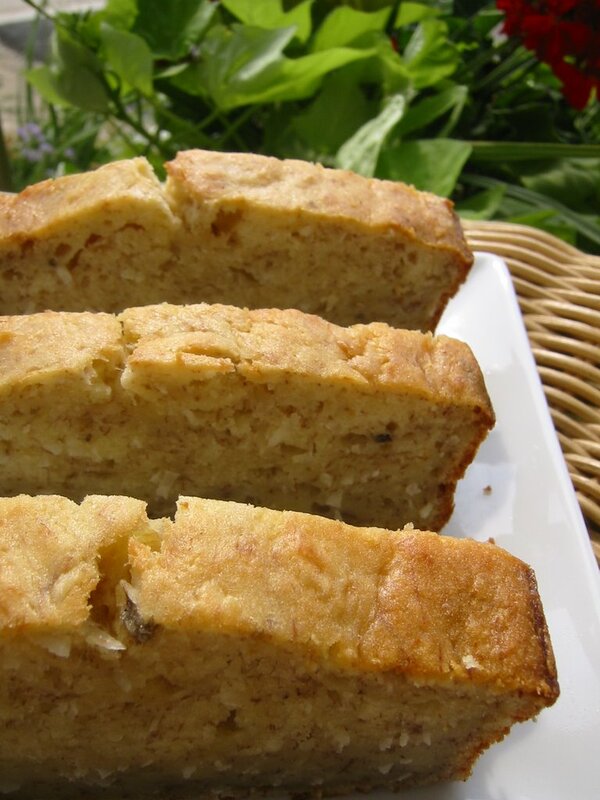 This is another great recipe for using any apples you have hanging around. 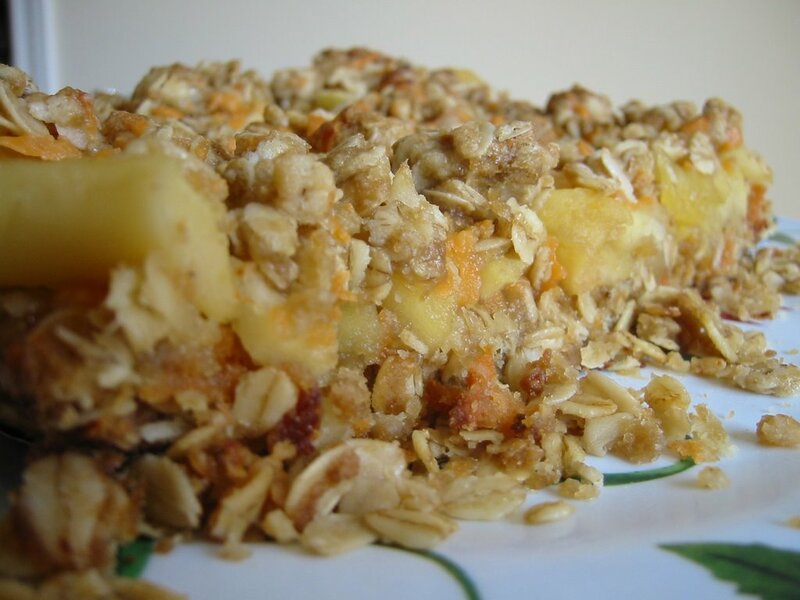 The filling consists of simmered apples layered between a cheddar-oat crumble. The cheese adds a subtle tang to the sweet apples and it tastes reminiscent of apple crisp or pie, just in bar form. I would make these again because I usually have all the ingredients on hand. Also, I would recommend waiting until the bars are completely cooled before cutting. 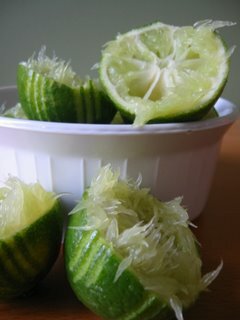 I cut mine when they were still warm so I didn't get clean edges but they do cut cleanly if you wait. I don't usually have Oreos on hand at my house. My mom gave me a package on the weekend and, of course, I couldn't just eat them - that would be too easy so I decided to do something creative with them. I remember seeing a recipe on Bakingsheet for Oreo Cupcakes and with that inspiration I looked around for a similar recipe that didn't require a whole package of cookies. I found an easy recipe for Oreo Muffins on AAA Recipes. It looked reasonable with all the proper ingredients so I decided to go ahead. The muffins came together nicely and I added an extra smidge of milk to get the batter a little softer. I would recommend leaving the cookie part in big chunks. 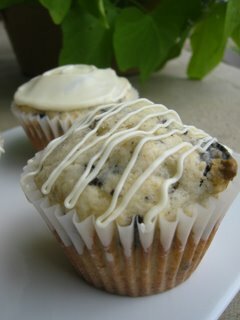 Crumbs just dissolve and with the big chunks, the muffins stay black and white. The muffins, surprisngly, weren't very sweet (and oddly tasteless) and had a dense crumb. I didn't really detect an overt Oreo flavour but I was happy about how they baked - these are solid muffins. They went over well with the kids and I just added melted white chocolate on top to decorate and give them some extra flavour. I hope everyone had a nice long weekend. Mine was fun and busy - one activity after another. Yesterday I found some time to make some banana bread with the three bananas on my counter. I wanted a recipe that would use them all and I found one in the Buttercup Bake Shop Cookbook by Jennifer Appel, one of the co-founders of Magnolia Bakery. I haven't delved into this book enough to say its good or not but, the banana bread was tasty. It was very dense and chewy, not light and airy. If you like this type of texture then you'll like this bread, if not you may have to put those three bananas to another use. The batter was easy to prepare and if you have no nuts, some type of dry add-in would work or you can just leave it plain. Now that summer vacation is here, I'm hoping to have more time to put into trying out new recipes. I will definitely explore this book some more. Have a great day!